the continual condition is an exhibition of new works by Brendan Van Hek that brings together neon, furniture and glass forms in a series of arrangements. Positioned across the gallery space, these arrangements assemble disparate elements in a tentative, precarious, unexpected or even ill-fitting manner - yet the arrangements hold. There is a sense that the different elements can uphold or sustain one another, and seemingly they find a balance point between need and support, so that equilibrium is reached. 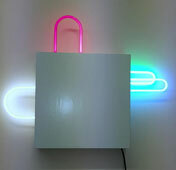 The neon is supported by the furniture, and in turn it provides the furniture with a sense of purpose; the glass objects and furniture are lit by the neon and they in turn prop the neon up. The arrangements then are like an encounter - separate things come together and find a way of interacting and relating, and find a momentary balance. 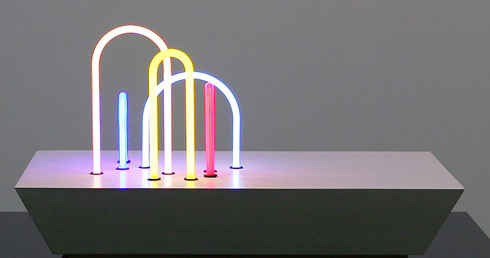 The work builds on Van Hek's extensive use of neon, while reconnecting to early beginnings when furniture was used recurringly in his sculptures and installation. This work also sees a new direction in his practice through the glass elements that were developed through a residency and subsequent close collaboration with the Canberra Glassworks. The exhibition runs concurrently with a one-month residency, held at the North Metropolitan TAFE. The residency will allow Van Hek to re-connect with the Perth art community through a series of talks and meetings, and will see him work closely with local neon manufacturers to develop new work through dedicated studio time. Whilst in residence he has also been commissioned by the City of Perth's Winter Arts Festival to create an exciting installation. Van Hek was born in Perth in 1968 and graduated with Honours from Curtin University in 2001. He currently resides in Sydney. He has exhibited nationally in significant exhibitions and galleries, including: Spring 1883, Windsor Hotel, Melbourne, and Static and Silence at the Lock-up Gallery, Newcastle in 2016; Colour Restraint (with Rebecca Baumann), Campbelltown Arts Centre, 2015; turn the night to day, Sarah Cottier Gallery, Sydney, in 2015; LUMINOUSFLUX, Lawrence Wilson Art Gallery, Perth, 2013; NEW11, ACCA; Some Kind of Love Story, Anna Schwartz Gallery Sydney, 2011; TWMA Contemporary 2010, Tarrawarra Museum of Art; and A Certain Slant of Light, Perth Institute of Contemporary Arts, 2009. 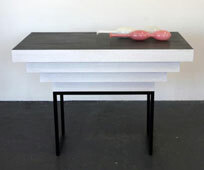 Van Hek has also exhibited internationally in Amour Fou, New Westminster New Media Gallery, Vancouver, Canada; Shifting Geometries, The Australian Embassy, Washington DC, USA and Becoming: Worlds In Flux, C24 Gallery, Chelsea, New York, USA. In 2012 he undertook a residency at ISCP, New York, and was the recipient of a Mid-Career Fellowship from the Department of Culture and the Arts WA, and in 2013 a Mid-Career New Work Grant from the Australia Council for the Arts. His work is held in various collections including: the Art Gallery of Western Australia, Artbank, Westpac, Australian Embassy Washington, Murdoch University, Lawrence Wilson Art Gallery, Holmes á Court, and private collections.